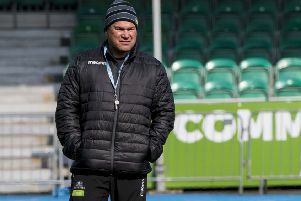 Glasgow Warriors head coach Dave Rennie joked that the Conference A leaders could pack out Celtic Park for a Pro14 final on their own after their wonderful five-try win at Leinster. Glasgow have been ruthless in the league lately as they go in search of a coveted final in their home city on 25 May. Their comfortable win over Leinster completed a remarkable sequence of seven wins in a row in which they have registered six bonus points. Tighthead Zander Fagerson was the unlikely hero at the RDS, with his 73rd-minute effort earning another bonus point to edge further clear of Munster at the top of Conference A.
Glasgow are three points clear with one game remaining and Rennie and his players dare to dream of playing in the decider. “We are available for that,” said Rennie. The 56-27 hammering at the hands of Saracens in the Champions Cup quarter-finals has focused the minds for Glasgow. Since then they have secured back-to-back wins over Irish provinces but welcome local rivals Edinburgh to Scotstoun on the final day of the season. Munster’s bonus-point win at Benetton means it is all still to play for and Rennie knows everything could change in Round 21. “I wasn’t too upset that Munster won. It is going to keep a bit of edge about us. It is going to be the same going into the Edinburgh game. They will be desperate as well. It is all set up for an interesting finish,” said Rennie. “We would like to be still in two comps. We were poor against Saracens and learned a few lessons. We have responded really well. I am really rapt with the attitude and how hard we have worked. Although they coughed up a bonus point, the Glasgow defence was stingy while their attack was precise in Dublin. Half-backs Ali Price and Adam Hastings were awesome with ball in hand, Price set up Sam Johnson’s opening try while Hastings allowed Tommy Seymour to cross for the second. Hastings, in particular, stood out. He attacked the gainline with the ball in both hands and continues to provide ample opportunity for his wingers. “I’ve been really lucky to play with quite a few guys who are that way inclined over the years at Glasgow,” said Seymour. “Adam fits into that mould really nicely and he’s growing in confidence and, importantly for us, going into the last two weeks, they’ve been great performances from him. “He’d openly admit he’s still sometimes pushing the boundaries a bit too far, and does things he doesn’t need to but that’s part of learning at that age, learning when to press forward and when to be conservative. “Not to bring it back to my try, but that’s the perfect example of his skillset. There’s not that many players who can see that option, let alone execute it. It’s great to have guys like that on the pitch. It can unlock defences in very special ways. 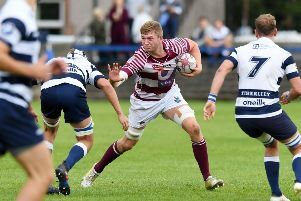 “He’s definitely got some Finn Russell in him but they’re individuals who set themselves apart from each other. Matt Fagerson and George Horne were also on the scoresheet in the RDS, and with 34 points from 35 now in the league, Glasgow look set for top spot in their conference. “We were disappointed a few years back when Murrayfield would have been an option for us, to have the final in Scotland, to know that it’s a few miles down the road would be even more spectacular for us and our fans,” said Seymour. “But there’s a lot of rugby to be played, we can’t focus too far ahead.